Even when setting aside the charming Jeffrey Donovan, Hulu's tarot card drama sports a stellar cast from shows like "The Americans," "Dexter," and "Fargo. But its future remains fuzzy. Plenty of shows these days embrace their inner batshit insanity. Challenging norms via wild narratives or atypical execution is so deep within their nature that the show thrives on such inherent madness. Here at IndieWire, we refer to such efforts as “bonkers” TV, and Hulu’s latest original series, “Shut Eye,” could certainly be a candidate if it ever fully leans into its freshly bizarre elements. After all, this is a show that constructs a climactic scene in which a woman walks between two rows of gypsies in a candlelit East L.A. mansion as the offended parties spit on her. And that’s just the start of her punishment for breaking the gypsy code. What comes next is enough to make even hardened TV viewers raise an eyebrow. Yet “Shut Eye” blends a bit too much of the familiar with its crazy. Primarily tracking a veteran tarot card reader heading a syndicate of psychics across the greater Los Angeles area, Hulu’s drama incorporates a reality into a world ripe with oddities. L.A. streets and neighborhoods are utilized as only on-location shoots can be, making what we see behind closed doors feel possible in our real world. After all, we all pass psychic shops on the street corner, but only a few of us venture inside. We all get to enter through this series, but what we see there doesn’t feel gritty and real or outrageous and fun. But let’s not forget the gypsies. At the onset, these gypsies come off simply as a family of gangsters. What they do in their own time and where they’re from doesn’t seem to change the attitude they bring to business, nor does it keep their leader, Fonzo (played by “Fargo” Season 2’s Angus Simpson), from becoming the sporadically violent heavy eater commonly associated with Italian mob kingpins. They’re a distinct, unexplored group reduced to stereotypical traits of illegal family enterprises. It’s a shame creator Leslie Bohem is unwilling to “go there” (yet — we’ve only seen the first four episodes) when he’s got all the pieces in place for a good time. Working from the bottom up, “Shut Eye” has hired a number of recognizable and well-liked character actors TV fans should already love. Susan Misner, everyone’s favorite EST member from “The Americans” (a.k.a. Stan’s ex-wife), plays a doctor with some wacky ideas to help Charlie get his head right. David Zayas is a questionable client with some ties to the L.A. underworld — very much the antithesis of his “Dexter” character, Detective Angel Batista. 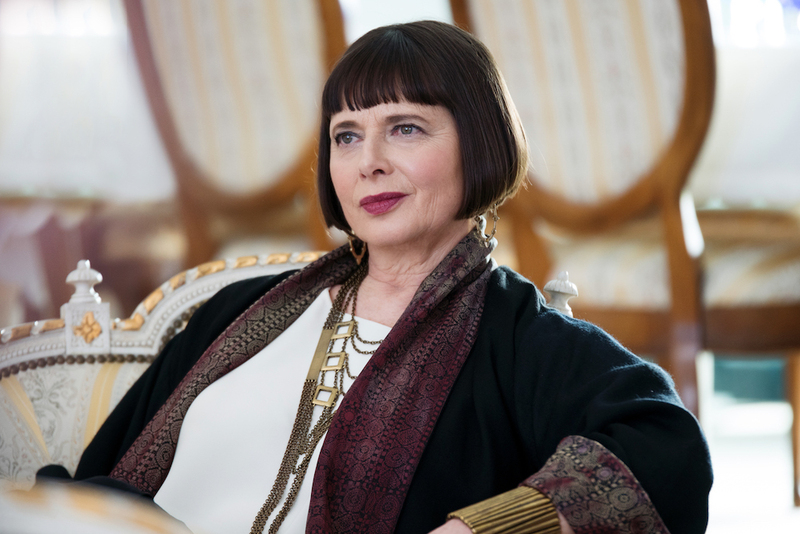 Isabella Rossellini — who films fans undoubtedly remember from “Blue Velvet” and TV fans know as Ross’ “alternate” on “Friends” (not to mention Jack Donaghy’s first wife on “30 Rock”) — plays the powerful mother to Angus Simpson’s gypsy leader son, making for another formidable family duo following up the latter’s turn on “Fargo.” Their brief face-offs thus far with the core clan’s matriarch, Linda, are made all the more enjoyable thanks to KayDee Strickland, who proves a formidable force here; more than just a treat for “Private Practice” fans. Yet there’s a nagging feeling he’s got more to give than “Shut Eye” has to offer. We’ll be curious to see what the second half of the season delivers, but its uneven presentation thus far, torn between grounded and outlandish, fails to give a proper platform to its stars (even if they manage to squeeze in moments on their own). A blurry reading is better than a bad one, but “Shut Eye” may only find the light when it loses its mind.